Yikes! Forgot it was Friday the 13th. My grandmother made and canned a similar jam every year and my favorite way to eat it was on black eyed peas with a side of cornbread. Mmmm, mmmm...I could eat a whole plate of that! That sammic looks fantastic!! Oh man, this is a very yummy way to go, my mouth is watering. Great use for that jam! Ooh, fun! I love creative, different sandwiches and yours definitely qualifies. man that sounds so good right now. I'm trying to write and I keep looking for excuses not to write, but damn how I love these kinds of sammies. Have you tried working this with a tuna casserole or chicken ? My kids love dunking their grilled cheese sandwiches in tomato soup, which drives my husband nuts. Brilliant solution to put the soup into the sandwich! I love the twists on classic dishes. Well done! I'm in a similar predicament, though I'm trying to use up homemade ketchup. I recently used it with Korean fried chicken, which I bet would also be great with your tomato jam! I am not a fan of grilled cheese but maybe with the pairing of tomato jam and pepper jack, it might change my mind. Your photo is gorgeous! I'm not crazy about anything tomato-y. Maybe if it was combined with some ricotta. For some odd reason I like ricotta with tomato based sauces. Mmmmm! I need to get me some of that tomato jam. What a color! The sammie looks great. Very clever, Grace!! And I'm with you... the fewer dishes dirtied, the better. That must taste great! Nice combo! We LOVE grilled cheese sandwiches and tomato soup together! (I thought everyone did!) My husband actually can't have a grilled cheese without the soup. I am going to have to make some of your jam! This looks heavenly to me! I've added a couple of slices of tomato to a grilled cheese before, but this is takes it to a whole new level! Grace for the third & final Friday the 13th for 2009, you have give us a great 'new classic'. I usually like to put tomatoes on my grill cheese, but I bet your tomato jam puts a 'gc' over the moon. Have you ever tried your tomato jam heated and used as a dipping sauce for french fries? Hey, you never know! Oh my, that sounds so good. My mouth is seriously watering at the thought (and photo!). Maybe next time caramelize some onions to throw into that sandwich? That would be my suggestion...mmmmmm. Yum! 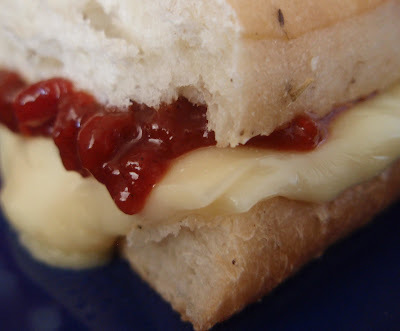 The cheese sandwich sounds really good with tomato jam! Wow, I want to taste this! The rosemary focaccia sounds great for this sandwich. Actually, it sounds like a dressed-up grilled cheese that could be cut into little squares and served at a cocktail party. I love tomato slices in my grilled cheese so I KNOW I would love this sandwich. Mmm good. Tomato Jam, genius! I'd pair mine with a nice wedge brie on a slice of baguette. YUM that is my #1 favorite comfort food lunch, I wihs I had some of that tomato jam right now on a cracker with pepper jack! I have got to make that tomato jam! This looks like the best grilled cheese. Ever. Tomato jam?? No ideas here as I have never had it! But it does sound delish! My grandmother used to make tomato jam and it was amazing! It was perfect on toast or homemade bisuits. Your classic looks fanastic, especially with the pepperjack! Can I have some! This just makes me want to reach into my computer screen and take it! It's quick and easy- love this! I've actually never had tomato jam, but now I want some! Pepperjack cheese is my favorite too! But it's so gosh darn expensive here. Butter, pepperjack, and tomato jam... Absolutely FABULOUS sandwich. BTW Grace: Lovely interview on Duck in Her Pond! What a great idea.. the most adventurous I get with my grilled cheese is adding a slab of meat in the middle. ;) I love the color of your tomato jam! I'm so sad that I didn't make tomato jam. I won't miss the opportunity next summer. Your sandwich is mouth watering. I came over from the Pond. I have never heard of tomato jam before. Awesome! Yep! I can definitely feel my quivering lips all over your sandwich creation!I would be eating it in a dark corner before the whole clan wants a piece of it! My favorite sandwich is a grilled cheese with tomato on some great bread. Saw your interview with Duckie; your kittens are precious! What a mouthwatering sandwich. Love that melted cheese. I love this combination, great take on the classic pairing of grilled cheese/tomato soup. Homemade tomato jam, how I want thee. wow...tomato jam? I've never heard of that but heck, why not? and what a great idea to use it with a yummy cheese sammy. shoot, you could use it with just about anything you'd use a tomato on, right? burgers, sliders, ham and cheese. Just the sound of tomato jam is already a temptation that I cannot resist. Oh pepperjack...I have a love hate relationship with it. I must surely try this lovely combination of yummie flavours!! This sounds delicious! I bet the tomato jam would be excellent with goat cheese or brie cheese too. Mmm..mm..that tomato "ooze" looks so good. Hhmm, maybe you could use the tomato jam to serve with savoury muffins? Eg, bacon ones? I would love this on a turkey panini with gouda cheese. Glad we all survived Friday the 13th! What an interesting jam this would be...My father in law loves tomatoes so i bet he would love this jam...the sammie would be a big hit also. Please stop over at Mimi's Kitchen I have something for you. THAT is the ultimate sandwich. It's hard for me to think of something better than that. You could do some sort of fancy schmancy crostini. YUUUUUUM! You could have it with a baked pepper and some nice crumbly, melty cheese? Tomato jam---yum! I'd definitely eat that sandwich...with a huge slab of bacon on top! Cheese crackers with tomato jam-----yum! THis sounds so easy and excellent! Very creative! Sounds like a great combination! How does the tomato jam differ from a premium ketchup? I've never tried it but it sounds interesting. That IS the perfect use for tomato jam, and pepperjack cheese, can't beat that! Awesome, awesome gourmet sandwich! A brilliant pairing!